Mark D. Faram/Staff Actor Ernie Borgnine shows off his new chief petty officer cover at the Navy Memorial in Washington, Oct. 17, 2003. 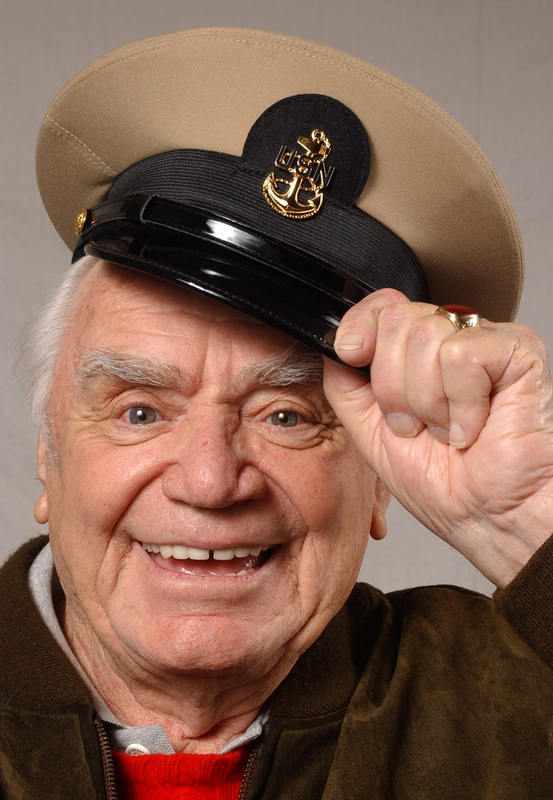 Ernie Borgnine was the reason I joined the Navy, though I didn’t meet him until 2003 at the Navy Memorial in downtown Washington, D.C.
As a child growing up in the 1960s, one of my favorite television shows was “McHale’s Navy,” with Borgnine playing the part of Lt. Cmdr. Quentin McHale, drawing from his own experiences in nearly 10 years on active duty. I had read on the web that he’d been a chief gunner’s mate, but when I brought that up, he quickly put that issue to rest. When then-Master Chief Petty Officer of the Navy Terry Scott heard Ernie wasn’t a chief, he was surprised, too, and decided to fix the oversight. The next time Ernie came to town, about six months later, this time to be the master of ceremonies for a concert by the U.S. Navy Band, Scott had him over to his house and pinned Ernie as an honorary chief petty officer. Knowing that Scott was going to pin Ernie, I made a trip to the Washington Navy Yard and purchased a Navy chief’s cover. Both Scott and Ernie were at the memorial the next day and Scott put the cover on Ernie’s head, completing his honorary advancement to the goat locker. He then sat down for our photo shoot. He grabbed a coffee cup and scowled like mean chief, but without direction, he suddenly put his hand to the brim of the hat to tip towards the camera. The picture was magical and vintage Borgnine. You’ve probably seen it — it’s been all over the Internet since Borgnine’s death Sunday at the age of 95. But here it is again.